I love a bargain. Years ago, Mom introduced me to the idea of going to garage sales. People sell the darnedest things at their garage sales. If you keep your head and are persistent, you can find many things you want or need, all in near perfect condition, for a fraction of the cost with NO TAXES due. 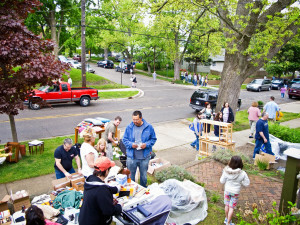 Garage sales take time, you have to hit quite a few before you find the item you want or need. If you are in more of a hurry, find a thrift store instead. But, find one in a high end neighborhood, one where the store sorts through the donations to select only the best. Expect to pay a bit more in a thrift store, but if it is run by a charitable organization, you can feel good about paying a few bucks more because you are helping out the cause. 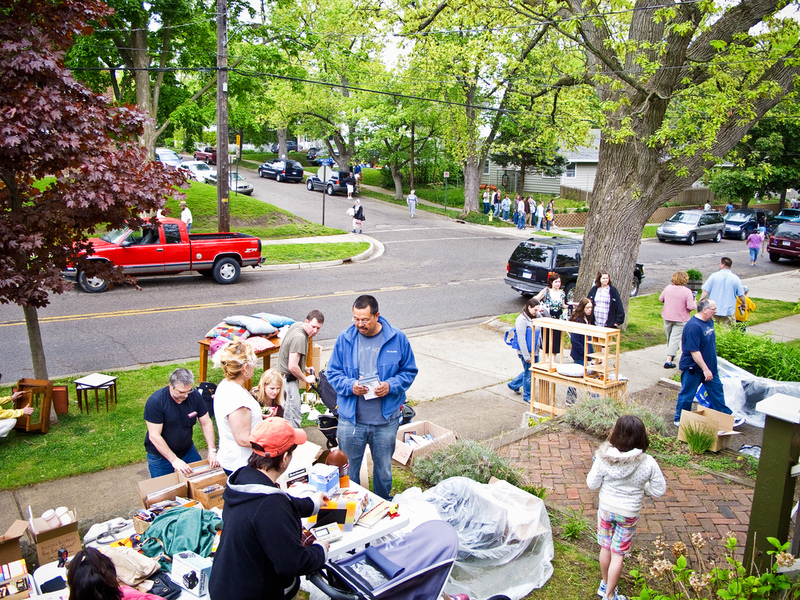 In my area, garage sales run spring, summer and fall – usually starting on Friday morning and running through Saturday about noon. I look for the neighborhood sales, which are usually either in spring or fall. That way, I can hit a lot of sales in just a few hours instead of spending time and gasoline driving around town. Look for sales in neighborhoods matching the kinds of things you want to buy. For example, if you want to buy slightly used home furnishings, find an upscale neighborhood where the kids are mostly grown. The adults in these neighborhoods typically have more discretionary income and may be prone to re-decorating more often than others. Sometimes these types of neighborhoods have folks that have lost parents or parents have moved into smaller homes or retirement communities and have given their adult children some of their treasures. Treasures which the grown kids don’t want or need! In these kinds of neighborhoods I’ve found limited edition artwork, custom made flower arrangements, housewares received as wedding gifts years ago but never used and older, well kept silver plate sets. If you want to buy kids toys or clothes, look for new home neighborhoods with lots of pre-school or grade school aged kids. I found a scooter for $1, a dollhouse for $75 and lots of kid clothes, worn once or twice and then outgrown. If you want vintage or antique finds, older neighborhoods or houses in more rural areas may be your best bet. Moving sales might also be good to check out. In my years as a garage saler, I’ve had lots of fun, and found some great bargains – many of which I still own and enjoy. If you are still reluctant to buy used, consider the below bargains. A wicker love seat and ottoman I bought it for $15 total. Today on Wayfair, I found the exact style of the love seat for $1000 (it had cushions though and mine didn’t), but I have a matching ottoman with a magazine shelf underneath. A heavy duty wrought iron patio table, 4 chairs and umbrella with stand for $50. It is similar to one at Modaseating, where just the table costs $172. A can of Rustoleum fixed this up for use. An outdoor bench with oak slats and iron insets for $2. A similar one on Wayfair is selling for $104. But, mine was in pretty bad shape. I had to take it all apart, repaint and restain it and seal it and then put it back together again. It cost me some time, but I love to refurbish things and didn’t mind, now that I’m retired. 6 pair of drapes for $3. I bought these for the material, which I will use to reupholster two wing back chairs in my vacation rental, unless of course I decide to actually use them as drapes down there instead. Finding a new purpose for an old item is one of the joys of finding bargains at garage sales. Always think about alternative uses for things you see which look interesting. A wheel barrow – free. My neighbor’s garage sale was almost over when I stumbled on it. She pressed the wheel barrow on me for free so I took it home. It would have been perfectly functional (although a bit rusty) as is, but hubby decided to paint it. The darn paint ended up costing almost as much as a new (cheap) wheelbarrow would have cost. A brand new croquet set – $5. I saw an almost exact same set at Walmart for $37.50 marked down from $67.50! A few years back, I bought myself a croquet set and proceeded to teach my grandson how to play. I had been thinking about getting him one for Christmas and so when I found this brand new one last weekend at a garage sale, I snatched it up (well, I still negotiated a couple of bucks off the asking price). It is still in the shrink wrap. It will be an extra gift for my grandson’s family next Christmas. Two 6 foot folding tables at $12 each. You see these anywhere from $45 to upwards of $80 each. We are always having large family gatherings so when I saw the price sign on these tables (underneath all the stuff for sale on top) I decided to grab them. They are perfectly functional and look great. The only problem, if you call it that, is that they are so sturdy that they are very heavy. Garage sales and thrift stores are great places to find books and DVDs. It just takes awhile to sort through what you aren’t interested in to find your gems. I usually don’t even bother looking unless they are organized to show the bindings for easier viewing. Typical garage sale prices are $.25 for paper backs and $1 for hardbacks, $2 for DVDs. I’ve also found name brand, like new blouses, coats and shirts for myself and other adult family members; enough travertine tile to re-do my Jack and Jill bathroom floor; a table top swivel fan we’ve been using now for a couple of years; and much more. What have been your best finds? I simply don’t have the time to do this, but I know there are deals to be found out there. I’d love to look at estate sales as I know there are often good deals on tools and things like that. I have wanted a tool chest for years but refuse to pay hundreds of dollars buying one new, when my hunch tells me that I could find one out there much cheaper. My best find was a 35mm camera that seemed like it was broken. Turns out that the only thing wrong with it was that the battery was upside-down. There’s so much abundance in our modern society that it makes me wonder why anyone buys anything new … cheap living in the west is possible through second-hand purchases!